Nespresso is a popular coffee developed by Nestlé. It uses Nespresso capsules that you input in a Vertuoline or OriginalLine Nespresso machine to make the coffee brew within minutes. The main advantage of Nespresso capsules is its competitive price as well as ease-of-use. Sure, we all love to make a traditional coffee from freshly grounded coffee beans because of its superior taste and powerful aromas. However, some people just do not have the time and prefer to get their coffee in minutes without sacrificing too much in terms of taste and flavors. The solution is Nespresso capsules! If you are fresh on the market for such capsules, we have a hand-picked selection of some of the best Nespresso capsules on the market. Let’s see which flavor and brand you need to buy. This popular Diavolitto Nespresso capsule is compatible only with Vertuoline Nespresso machines. Out of the box, you get 50 capsules with this purchase. Each capsule can prepare a coffee of 1.35 oz which is a medium-size cup. But that makes this product one of the best Nespresso pods in this review is its intensity. Indeed, the Diavolitto has an intensity of 11 out of a maximum of 13. This means that this coffee is very intense and strong. If you need a strong morning coffee that is flavorful and easy to prepare, this coffee is an excellent choice. Moreover, the aluminum capsules used in this coffee are 100% recyclable, so they are environmentally friendly. This coffee is more bitter than others. Only get it if you like your coffee to be ultra-strong and a bit bitter. What the Melozio get perfectly right is its balance between intensity and taste. Indeed, with an intensity of 6, it is not too overpowering as a coffee. The Melozio has a smooth and full-bodied taste. After all, it is made from 100% Arabica beans, so it is definitely a smooth tasting coffee. Also, the capsules are compatible only with Vertuoline Nespresso machines. But it is incredibly easy to use. Indeed, the Vertuoline machine uses the barcode imprinted on the Melozio capsule to prepare a tasty and exact tasting coffee as the manufacturer’s recipe. This Nespresso coffee also has many labels like the Rainforest Alliance label that shows that it is a quality coffee that remains respectful of the environment. Talking about the environment, the Aluminum capsules are fully recyclable so you can safely discard them in your bin. Therefore, taking all those factors into account, the Melozio is definitely one of the best Nespresso VertuoLine capsules on the market. 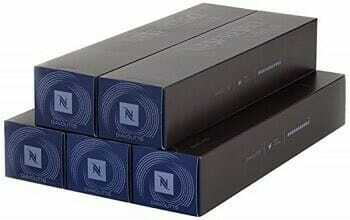 Even if you get 30 capsules with this Nespresso product, 1 capsule can brew a large cup of 7.8 oz. We recommend this capsule only for those who are heavy coffee drinkers and need a large brew per capsule. Due to the low intensity of 4 of the Voltesso, it is one of the smoothness Nespresso coffees on the market. Indeed, if you love your coffee to be mild and yet full-bodied in taste, the Voltesso is one of the best Nespresso capsules for your need. Not only is this coffee made from 100% Arabica with Brazilian and Colombian origin, but it is also quite aromatic with a light and sweet espresso as well as Brazilian Bourbon taste. So as to remain environmentally friendly, the Aluminum capsules are fully recyclable. 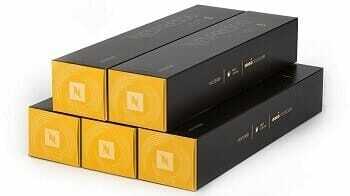 And if you are a daily coffee drinker, you get no less than 50 capsules with this Nespresso product. One capsule makes only 1.35 oz of espresso coffee, which is not a lot but definitely more than adequate for the casual coffee drinker. The Vivalto Lungo is the ideal coffee for those who are not certain what the Vivalto Lungo is all about but want to give it a try. Indeed, the price of this coffee is also one of the lowest that you will find in this Nespresso capsule review. You get only 10 capsules but more than enough for you to try it out and see if it is a right fit your taste or not. Moreover, this coffee has a sweet cereal flavor with floral undertones. If you like your coffee to be aromatic and mild, the Vivalto Lungo is an excellent choice. Not to mention that this Nespresso is also decaffeinated with its caffeine level removed by up to 95%. Therefore, if you have been advised to intake only decaf coffee, this Nespresso is an excellent choice. This Nespresso product is ideally suited for those who are not sure what the Vivalto Lungo is all about. Since it is inexpensive, you can easily try it out and see if the taste is to your liking or not. The Volluto is another mild and slightly fruity Nespresso coffee that is ideal for those who like their coffee to be light but full of flavors. The intensity of 4 is not much for a Nespresso but still provides a small kick. Moreover, this Nespresso coffee has a sweet biscuit taste with a round body which is quite delightful. It is compatible with only OriginalLine Nespresso machines, and as long as you have this type of Nespresso machine, you are good to go. For your money, you get no less than 50 capsules which should technically last you a full month, as long as you are a casual coffee drinker. Indeed, one capsule of the Volluto makes a 1.35 oz cup of coffee which is medium-size. The Cosi is a low-intensity Nespresso coffee with a citrus flavor. It has an intensity of 4, which is not much. Moreover, you get 50 capsules with this purchase with each capsule able to make a cup of coffee of 1.35 oz. this is a medium-size cup of coffee, so, it is an excellent choice for casual Nespresso coffee drinkers. But what is interesting about the Cosi is definitely its fruity and citrus flavor which is quite rare in a Nespresso coffee. Moreover, this coffee is compatible only with an OriginalLine Nespresso machine. All in all, if you like your coffee tube with smooth tasting, mild and has a citrus flavor, the Cosi is one of the best Nespresso coffee capsules that you can buy. The Capriccio is a popular Nespresso that has slowly built a small reputation as being an excellent morning coffee. And that’s despite its fairly small intensity of 5. The reason for this is its taste. Indeed, the Capriccio has a cereal taste that makes it a great match with your breakfast. Additionally, this Nespresso has a low acidity level which makes it taste full-bodied and smooth. The only 2 caveats we note with this Nespresso is that you get only 20 capsules with this purchase so you will need to buy an additional pack for it to last you a full month, with daily Nespresso intake. Also, 1 capsule only makes a medium-size cup of 1.35 oz. This is not enough for those who like to drink a big cup of Nespresso every morning. However, despite all those, the Capriccio remains one of the best Nespresso compatible capsules as long as you have an OriginalLine Nespresso machine. The Rosabaya strikes the right balance between intensity and taste. With its intensity of 6 and cranberries taste, it is not a coffee that is too overpowering and will leave you time to enjoy the pleasant taste that lingers in your mouth. Moreover, this is one of the few Nespresso coffees that focuses its taste solely on a sweet and fruity taste of cranberries and redcurrants. When used in an OriginalLine Nespresso machine, you get 1.35 oz of coffee which is good enough for most people. However, despite its small coffee yield, the Rosabaya remains one of the best Nespresso capsules when it comes to intensity and taste. With the Fortissio Lungo, we move on to a more serious Nespresso intended for gourmet coffee drinkers as well as those who prefer to get a serious kick from their coffee. Indeed, with its intensity of 8, this is a fairly strong coffee that lingers a bit in the mouth, without being bitter in taste. Also, since it is made from 100% Arabica beans, you are bound to get a tasty and smooth Nespresso from the Fortissio Lungo. This Nespresso is also highly aromatic, and its sweet cereal taste is simply delicious. Since this coffee is naturally sweet, you will not need a lot of sugar as well. If you are planning to order only the 50 capsules variant of this product, you may get it in a bag and not a box which lacks shipping protection. The Indriya is a flavor-rich Nespresso that comes straight from India. It has a pronounced pepper and nutmeg flavor that gives you an exotic taste. In fact, when compared to other Nespresso coffees in this review, the Indriya is probably the most unique and exotic in terms of taste. Moreover, it has an intensity of 10 which means that this is a strong coffee that can deliver a powerful caffeine kick. If you need a strong Nespresso latte that will wake you up in the morning, the Indriya is one of the best Nespresso capsules for a latte you can buy. The Arpeggio works only with OriginalLine Nespresso machines. It has a traditional cocoa taste that is loved by many people, especially the younger generation. Out of the box, you get 50 capsules that should be more than enough for a monthly consumption as long as you are a casual Nespresso drinker. But what makes this Nespresso capsule different from others is its intensity of 9. This is considered the sweet spot caffeine level that is not too high or too low. Therefore, if you want a Nespresso that delivers a good caffeine kick without being too overpowering or bitter in taste, the Arpeggio is an excellent Nespresso for the money. The Ristretto is a popular Nespresso coffee in North America as well as worldwide. This Nespresso capsule built its reputation based on its high intensity of 10 which provides it with a series of caffeine kick as well as its chocolate flavor. Indeed, this is one of the few Nespresso coffees that have a traditional chocolate flavor and is also quite sweet. Therefore, you will not need a lot of sugar added to this Nespresso because it tastes good and sweet right out of the box. The only caveat we note is that this Nespresso capsule can make only 0.85 oz and 1.35 oz Nespresso cups using an OriginalLine Nespresso machine. Therefore, it is not the best Nespresso capsule when it comes to quantity. However, if you are a casual user or enjoy a good Nespresso coffee every now and then, the Ristretto is an excellent choice. There are 16 different types of Nespresso capsules that you can purchase on the market. Each has its own intensity, flavor and caffeine content. The most common Nespresso capsules you will encounter are Espresso, Pure Origin, Lungo, and Decaffeinato. 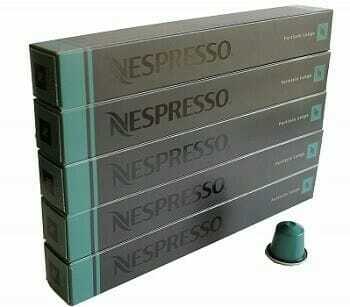 Espresso capsules: The espresso capsule is the first type of Nespresso capsules developed by Nestlé. It is referred to as a “shorter” coffee and has different strength because its caffeine levels vary from the capsule to capsule. 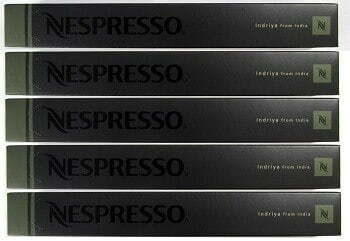 Moreover, there are no less than 6 different types of espresso capsules under the Nespresso name. And when it comes to the origin, the coffee in the espresso capsules come from a wide range of places like South America, India, and even Ethiopia. Therefore, it can contain both an Arabica and Robusta coffee depending on the brand that you purchase. Pure Origin: There are basically 3 types of Pure Origin Nespresso capsules. The good thing about this type of capsule is that it shares a commonplace of manufacture, so it is very easy to track its origin. Also, this is a “taller” coffee that has a more lingering taste in the mouth than an espresso. Lungo: The Lungo uses twice the amount of water than a regular espresso. Therefore, this is a bitter coffee and usually has a stronger caffeine content as well. The Lungo is known as a “tall” coffee, and in terms of taste, it sits right between an Espresso and an Americano. Decaffeinato: The Decaffeinato is a specialist Nespresso capsule that has been decaffeinated up to 95%. In addition, there are 3 different types of Decaffeinato, and each varies in intensity. Make no mistake, all of them do not have caffeine, but their intensity is mostly dictated by their flavors and aromas and not their caffeine content. As we know, in order to prepare coffee from a Nespresso capsule, you will need a Nespresso machine. There is simply no way around that. You will need to invest in a Nespresso machine! There are basically 2 types of Nespresso machines. The OriginalLine and Vertuoline. As its name suggests, the OriginalLine is the original Nespresso machine that was invented in the 1970s but really came to North America and the early 1990s. With the OriginalLine, you can only make 2 Nespresso coffees. The Espresso and the Lungo. However, those 2 types are spread and 26 regular pods, and to limited editions so there is definitely quite a lot of choice offered to the user. So, if you usually drink Espresso and Lungo only, then the OriginalLine is a great choice. On the other hand, the Vertuoline is more versatile and can brew 3 types of coffee. It can make the Espresso, the Lungo or a regular straight coffee. Moreover, the Vertuoline is newer in North America as it reached the market only in 2014. Therefore, if you want the latest and greatest, the Vertuoline Nespresso machine is a more sensible choice. Also, note that there are no decaffeinated Nespresso capsules in VertuoLine. Of course, at the heart of any decision when purchasing a Nespresso capsule is your personal taste. Not all Nespresso coffee tastes the same, and they vary in intensity. Nevertheless, the only surefire way to get the best Nespresso flavors for your taste is by experimentation. They are quite affordable, so if you have never tried them before, then we suggest that you purchase a few Nespresso capsule that has different flavors and tries them out. The intensity of a Nespresso capsule varies from 1 to 13. 13 is the highest intensity, and 1 is the mildest. Most of the intensity is dependent upon the level of caffeine, country of origin and flavors present in the coffee. If you normally prefer your coffee to be strong, then anything above 9 is usually a good choice. On the other hand, if you like your coffee to be mild and light, then go with a lower number below 7. If you want a tasty coffee but do not have the time to prepare it the traditional way, then Nespresso capsules are definitely the way to go. 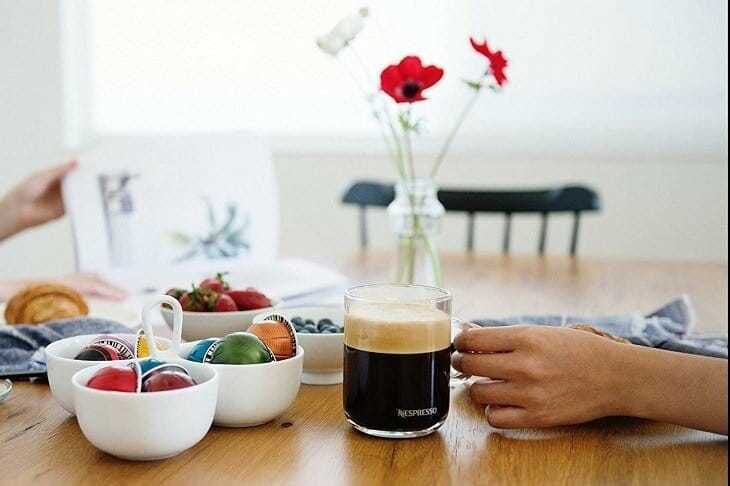 Nespresso capsules are affordable, easy-to-use and above all, they taste just like the real thing. Moreover, you do not need any experience to prepare a tasty Nespresso coffee using Nespresso capsules. All you will need is a Nespresso machine. On a final note, our Nespresso capsules review above contains some quality brands and flavors. If you are uncertain which Nespresso capsule to purchase just yet, don’t worry. Go through the Nespresso review one more time!